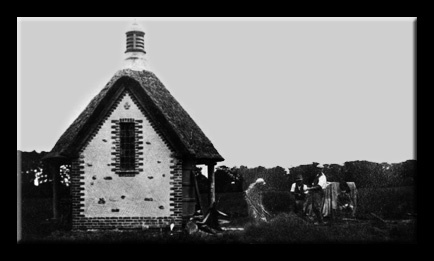 The Goodings lies just one mile south of East Garston and was, until the 1930s, farmed extensively. 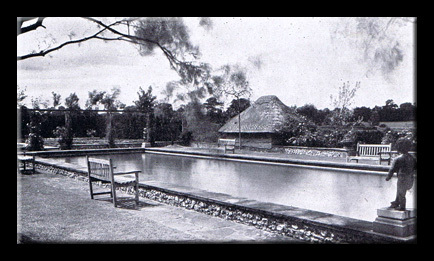 The first owner after the Burden: sale of 1919 was J.Froude, who bought the estate for £1,000. 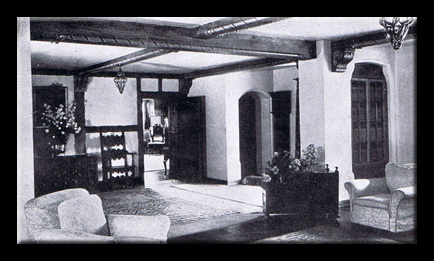 The main building which is the farmhouse was later purchased by F. W. Rickett, who spent most of the 1930s developing the five acres of grounds and the house into a large country retreat reflecting a wealthy lifestyle gained in the oil industry. In addition to being MFH of the Craven Hunt he had interests in what was then Abyssinia, and Haile Selassie, whilst in exile in this country, was one of several important visitors entertained at The Goodings. Rickett went bankrupt when Mussolini invaded Abyssinia, and left when war broke out in 1939. The estate was then taken over by the Admiralty and used for the first part of the war to accommodate and train Wrens as writers for the Fleet Air Arm. 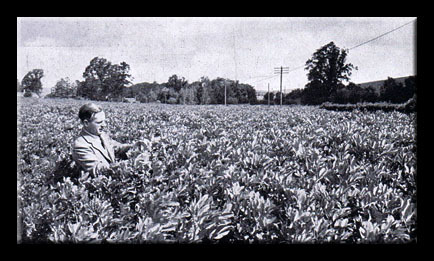 In July 1943 Country Life magazine announced that it had aquired the entire Goodings estate of 1,000 acres (including Parsonage and Pounds; farms) to run as a model estate. The intention being, to manage the estate using the best modern practices, and to plan its activities as comprehensively as possible. All work would be studiously recorded and ultimately made publicly available, thus a new and independent link would be established between the experimental station and the practical landowner or farmer. In the meantime however, the country was still at war, to which end, the estate owners pledged to co-operate fully with the Ministry of Agriculture in making the land as productive as humanly possible throughout the duration.. The house is not as old as it appears, for in the the early 1920s, an old farmstead stood on the spot, complete with pond, fold and outbuildings. It was known then as Gooding's Farm, "Gooding" - being the name of some previous long-forgotten owner. No attempt was made at copying the style of any particular period, the finished item was the product of its owner's wishes, and remains to this day, entirely pleasing to the eye. Two half timbered wings project over the drive. 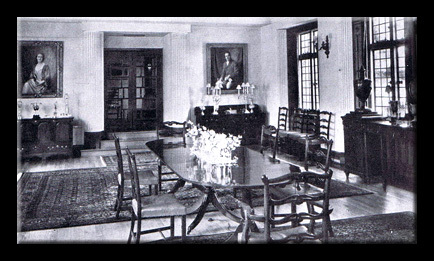 The dining room was beyond the second projection, the servants wing was to the right. 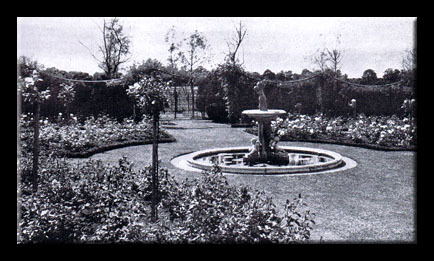 The ornimental gardens covered an area of some five acres, in addition to which there were extensive kitchen gardens, an orchard, swimming pool and two tennis courts. From the front of the house, the eye was presented with a vista of lawns, grassy paths and flowered borders, leading to its own golf course. There were, in addition to all the above grandure, an extensive range of garages, stables and out buildings. The house also had its own lighting plant and an emergency pumping installation. (Right). 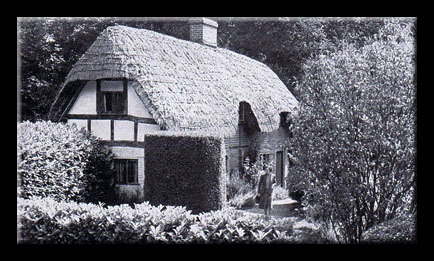 On Goodings Estate there were two substantial farm houses. The larger being Parsonage Farm, the other being Pounds Farm, which was situated on the western extremity of the estate, in nearby Eastbury. 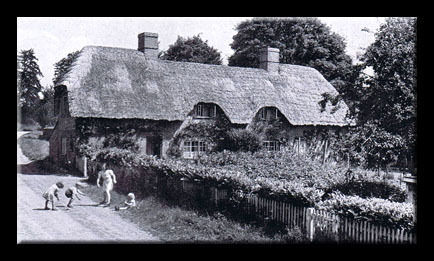 Also within the estate were ten thatched cottages all of which ~ as with all the buildings ~ had been scrupulously maintained by Mr. Rickett. 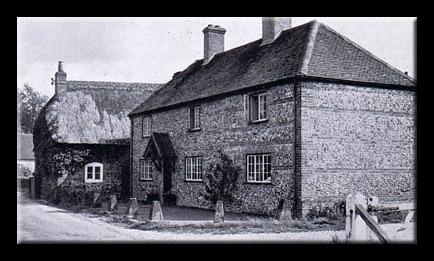 A few years later the house and grounds were acquired by the Order of the Holy Sepulchre, a community of Roman Catholic nuns who ran a preparatory school until the mid 1950s when the nuns moved to Denford House near Hungerford. they did until the mid-1960s. The following years witnessed the decline of The Goodings, which fell into disrepair, remaining sadly neglected until the early 1970s. The estate was then bought by a developer, who carried out extensive alterations, making it very much as it is today. Before this work could start the graves of several nuns had to be opened and the remains disinterred for reburial elsewhere. 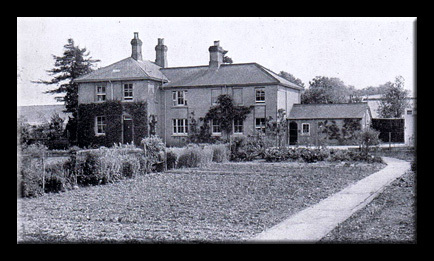 The Goodings now consists of nine luxury houses together with a chaplain's cottage and a head gardener's cottage, all set in 12 acres of land with swimming pool and tennis courts. The Pump Cottage, formerly known as the Pump House, can be seen just outside the main entrance, and is now a private house commanding enviable views over open countryside.